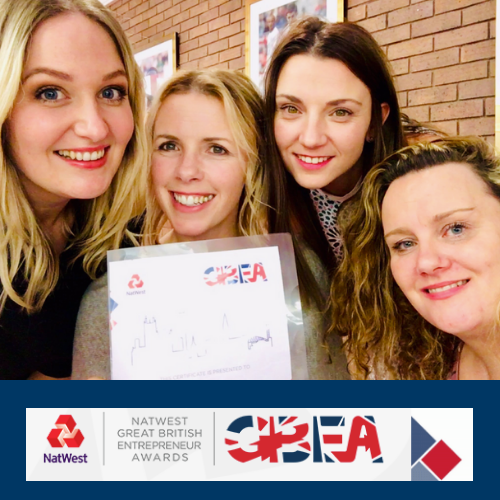 You may have heard that not so long ago, our Strategic Leadership Team (SLT) was shortlisted for ‘Entrepreneurial Team of the Year’ at the Great British Entrepreneur awards, sponsored by NatWest. Well, last night was the regional final and although we didn’t come away with the winner’s trophy, we did receive the runner up award – meaning we’re proud as punch with our second place. Out of a whopping 3,000 applications, it was an incredible achievement to simply be shortlisted, but to walk out of Old Trafford with the runners up title has left us further inspired. Within the original application we were asked how this team has contributed to a specific area of business growth or development and the projects which particularly impressed the judges were the creation of Apricity and also our dedicated graduate programme, The Grad Scheme. Apricity was officially launched at the beginning of 2018 and would not be the successful, revolutionary business that it is today without the team that we have driving it forward. From Cathi coming up with the idea of a new approach to compliance to now seeing that idea formulated as Apricity Compliance – shows just how much work and effort has been ploughed in and ultimately, how well deserved this award is. The Grad Scheme is our in-house graduate programme (across both Para-Sols and Apricity), used to encourage fresh talent into financial services. As a team, we work hard to shine a spotlight on the profession, debunk the myths and highlight financial services as a positive career of choice There’s much more to come surrounding this idea coming in the near future, so watch this space… but for now you can read about the success of one of our Apricity grads, Hannah, here. Together, our SLT run every aspect of both Apricity and Para-Sols on a daily basis – they work tirelessly, whether they are in the office, at home, on a train, on holiday (literally anywhere! ), making sure that not only the businesses continue to grow, but each and every individual also has the same level of nurture and nourishment dedicated to them. As a full team, we are incredibly proud of our SLT and grateful to the GBEA for the runners up title. We’ll see you next year and with a bit of luck, come home with some silverware….